Sasha's KoolStop Sun Covers are products designed for parents to use to protect their baby's/child's delicate eyes, skin and body from the harmful effects of the sun's heat, glare, cancer causing ultraviolet UVA/UVB rays, wind, dust, debris, and flying insects. They are water resistant and flame retardant. They are unique in that they protect, yet still allow parents to see in and children to see out at all times. 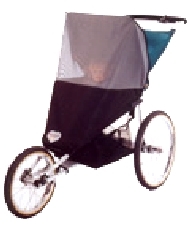 The Kool-Stride® "Senior/Paramount" Single Jogging Stroller Model Sun Cover - Custom designed to fit (canopied) Kool - Stride® "Senior/Paramount" Single Jogging Strollers by Kool Stop International, Inc. Size: Custom designed to fit (canopied) Kool - Stride® "Senior/Paramount" Single Jogging Type Sport Vehicle, made by Kool Stop International, Inc., La Habra, CA. Note: available directly from Kool-Stop International, Inc. La Habra, CA 90632. Call 800-247-9754 or 714-738-4971. The Kool-Stride® "Lil' Deuce" Model Sun Cover - Custom designed to fit (canopied) Kool - Stride® "Lil' Deuce" Double Jogging Strollers by Kool Stop International, Inc. 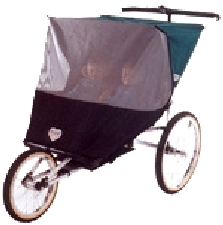 Size: Custom designed to fit (canopied) Kool-Stride® "Lil' DeuceTM" Double, Side by Side, Jogging Type Sport Vehicle, made by Kool Stop International, Inc., La Habra, CA. Why Buy a Sasha’s Sun, Wind & Insect Cover over other products??? Because Sasha’s Kool amd Kool Stride Stop Jogger Stroller Sun Covers offer the maximum Sun Protection, while being "see-through" (the most innovative new feature in years). The See-Through feature allows parents and guardians to see in and the child to see out at all times. Parents and guardians do not have to stop every five minutes to look under an OPAQUE material to make sure that their child is comfortable and safe. Sasha’s Kool Stop and Kool Stride Jogger Stroller Sun covers offer full front, side and back protection from the Sun’s Cancer Causing UVA/UVB Rays , the Heat, Glare, Wind, Dust and Debris and Harmful Insects, keeping the Car Seat, Stroller or Jogger cockpit and baby cool, safe, and comfortable. Sasha’s Sun covers also prevent fading of the Car Seat, Stroller or Jogger material. They are flame retardant and water resistant. And attach easily. Uses: anywhere outdoors. It has long been known that overexposure to the Sun's harmful Heat, Glare, and Cancer Causing Ultraviolet UVA/UVB rays, can cause skin cancer and other serious and sometimes fatal consequences to babies and small children. It has been well documented that babies under six months should not wear sunscreen lotions since their delicate skin is more likely to react adversely to the chemicals contained in these preparations. Protection is especially necessary for babies and small children, whose skin and eyes are particularly sensitive. However, protection against exposure to the sun can be difficult to provide when the child is being transported, as in a child car seat, baby infant carrier, carriage, stroller or jogging type sports vehicle. SASHA'S KIDDIE PRODUCTS, INC, HAS DESIGNED CUSTOM FORM FITTED SUN, WIND AND INSECT COVERS FOR KOOL STOP / KOOL STRIDE SINGLE AND DOUBLE JOGGING STROLLERS. THE SUN COVERS OFFER FRONT, SIDE AND BACK PROTECTION FROM SUN, HEAT, GLARE, WIND, DUST AND DEBRIS AND HARMFUL INSECTS, KEEPING BABY COOL, SAFE AND COMFORTABLE. THEY ALSO PREVENT FADING OF THE STROLLER MATERIAL. THEY ARE FLAME RETARDANT AND WATER RESISTANT. AND ATTACH EASILY. USES: ANYWHERE OUTDOORS. Stroller covers, jogging stroller covers and infant carrier covers that protect your baby and can be used as stroller sun covers, rain protection covers, wind protection covers, insect protection, wind protection, snow covers, sleet covers, cold weather protective covers. Also used as baby car seat covers, and baby stroller covers, sun protection stroller covers, infant carrier covers and jogging stroller covers.